Green & Blue Stones Wooden Napkin Ring This napkin ring holder is for setting dinner table decorate ornaments. this elegant napkin ring holder is used for setting home dinner table . 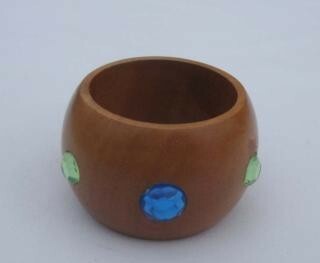 round shape wooden finishing material used with green and blue stones decorate all over napkin ring . Size : 3 cm. Width .